“Andy foresaw it all”, by Eric Wayne. 1/2017. 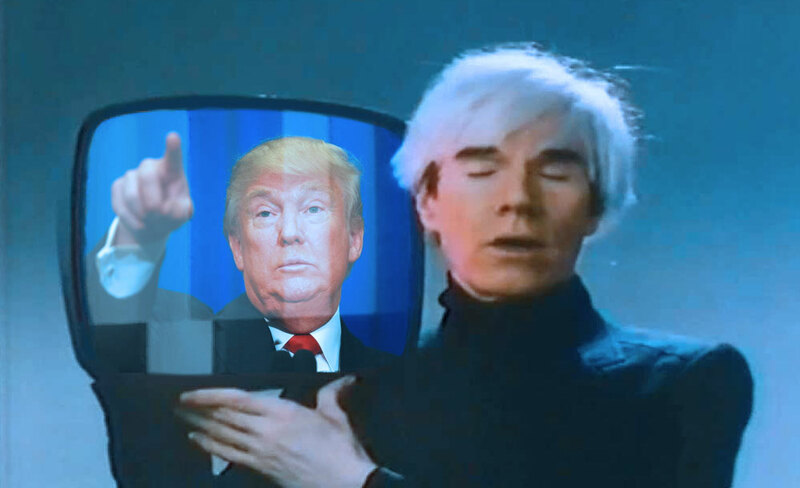 I liked the quick graphic (obviously I put Trump in the TV), but, Trump’s head is more in focus than Andy’s, so I decided to play around with other images I could find of Andy. Once I put it in B&W, there was a strange effect, which was that Donald looked like his image was from the 50’s or 60’s. My Warhol is also a composite of three pictures of him, though predominantly one. The glasses come from a separate image. So, overall, this photo of the cultural icon doesn’t really exist, and yet it has the quality of being historic footage. If you look at it there are a few little hidden things to find. It has a dreamy Surrealist feel, partly because of the waves, as if it’s something you saw in a dream. As for the cultural commentary, the article is coming soon. It’s critical of Andy’s legacy, but also a bit of an homage. I’m midway through a nearly 4 hour documentary on Warhol extolling his extraordinary greatness, and watched a shorter one yesterday. I try to keep open-minded. I like Warhol, but I’m much more of a fan of the far end of the other side of the spectrum, which would be the likes of Francis Bacon. So, yeah, started out as a graphic for a header, and I started getting into it, saw it conjured curious things, and decided it merited being a minor art piece of its own. I do occasionally do collages (and use collage techniques at some point in most of my art). I made a video about the piece, which you can watch below. 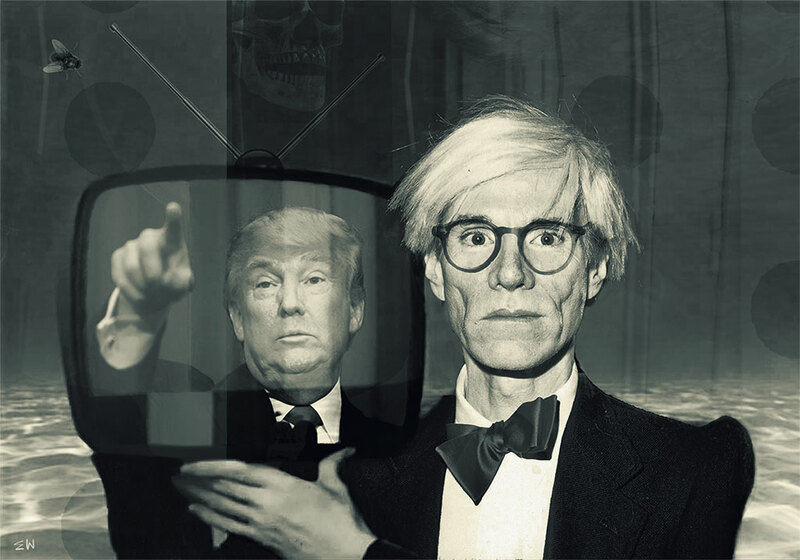 Posted in artTagged Andy Warhol, art, art history, collage, contempoary art, Donald Trump, photography, Warhol and TrumpBookmark the permalink. Thanks, Greg. I thought it had a certain something about it. Nice to have someone confirm my suspicions. And thanks for visiting my blog over a long period.